'How To Dismantle An Atomic Bomb' has entered the UK charts at No.1. On the eve of album release, BBC Radio 1 moved to U2's studio in Dublin. U2.Com asked the star DJ's why they dig. Plus: live stream of set. 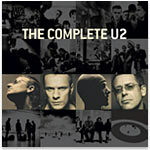 The new album has gone straight in at No.1 in Ireland. 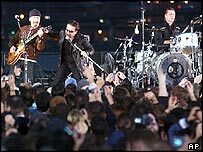 New Yorkers got the surprise of their lives yesterday - U2 performing from the back of a truck. The band performed on 'Saturday Night Live' on US TV at the weekend. USA Today praises the new album, as Edna Gunderson interviews all four band members on the eve of release. In London Sunday ? Stay up late and buy the new album at Virgin Megastores, Picadilly. Tonight In Dublin - Own it! In Dublin late tonight ? Buy the new album from midnight! 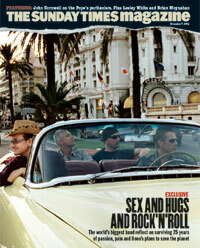 Which explains U2's 'brilliance', according to a glowing review of the new album in Rolling Stone. 'Vertigo' is now at the top of the charts in the UK, Ireland, Denmark and Italy. U2 performed five songs for Radio 1 from their Dublin studio tonight. Nine Days To Go Until The Real Thing! Incomplete versions of the new album turned up online at the weekend - thanks to the help of fans, many have now come down. The album reviews are coming in thick and fast and, guess what, MOJO love the new record! 'Classic', 'Masterstroke', 'Breathtakingly modern', 'Brilliant'. 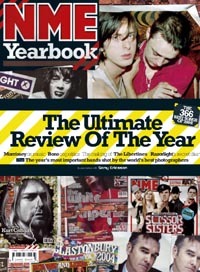 NME thinks the new record is quite good! Bono, writes for the 2004 NME Year Book, about his year in politics. Extract here. 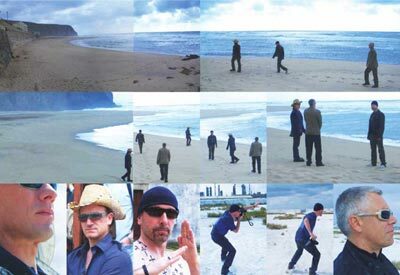 Vertigo, U2's new single, is released by Universal Island Records today. Twenty years on, Live Aid is finally released on DVD - catch U2's spine-tingling set in our video clip.